Every company looks for ways to better connect and engage with its customers and partners. The Community Cloud™ offers a platform that can be customized to create a personalized, connected, mobile community where partners, customers, and employees can connect and collaborate. Luxent’s Salesforce experts have vast experience designing and implementing highly customized Community Cloud™ solutions for clients. The Community Cloud™ gives accessibility for employees, distributors, and partners, offering access to products, images, documents, videos, links, etc. And because the Community Cloud™ is built on the Salesforce platform, the system is easily maintained: uploads and updates are just a few clicks away, even with hundreds of users and thousands of documents and files. Communities can be customized to match the look and feel of the brand, and Salesforce1 platform™ mobility provided by access anywhere, anytime for employees, partners, or distributors. Ultimately, users across departments can come together within a Community for increased collaboration that’s as seamless as it is powerful. BioTek, a medical device manufacturer, needed a solution to replace its previous three documentation sites that housed documents, files, and portals for both internal and external users. They wanted to enable collaboration between employees, distributors, and partners, as well as provide a seamless way to interact and share resources and knowledge. Using the Salesforce Community Cloud™, Luxent’s team of Salesforce experts created an easy-to-use solution that met BioTek’s needs and matched its branding. 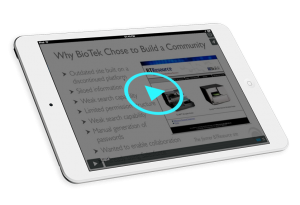 Because of the device-responsiveness of the Community Cloud™, BioTek’s community has mobile functionality so that collaboration, documents, and information are accessible anywhere, anytime, and from any device. Whether you want to create a place for more collaboration or are looking for a better way to keep thousands of documents, files, and sales and marketing resources organized and accessible to partners, distributors, and employees, Luxent’s extensive manufacturing knowledge, expertise, and insight can help you design and implement a highly customized Salesforce Community Cloud™ to meet all your business needs. Contact us to learn more.